Lebron James’ star power has put the Cleveland Cavaliers back on the NBA radar, and clean classic retro Jordan I’s like this one are going put them back in the shoe game. This Air Jordan I Phat Premier in midnight navy/ceramic-white hits House of Hoops locations in November. It is a limited release inspired by throw-back Cav’s colors. This is one of a few AJ 1 Phat Premier’s we’ve showed you including Atlanta Hawks, and Detroit Pistons colors. All of them have a “carpeted” swoosh, but this Cavs version has an interesting mix of leather and felt on the upper. 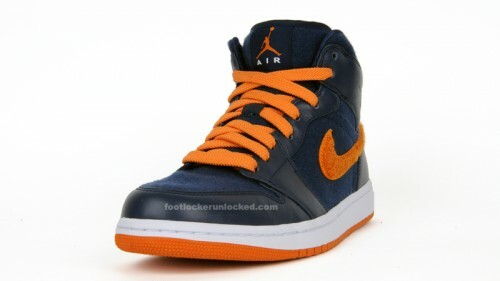 It has a ceramic colored outsole, laces, Swoosh, and embroidered Jumpman on the heel. For more detailed shots check out the gallery.